After adding references to the aforementioned dlls, you can declare a new RadDataFilter as any normal Silverlight/WPF control. To learn more about the usage of the Source and the FilteredSource properties, read the Source and Filtered Source article. RadDataFilter can filter any collection that implements the IEnumerable interface. The only thing that you have to do is to pass the collection to its Source property. Prepare a simple collection of employees and pass it to the Source property of the RadDataFilter. After the collection has been passed to the Source property, the user will be able to filter it via the RadDataFilter's UI. In order to learn how to access the filtered collection, please read the next section. RadGridView can be filtered through its RadGridView.Items collection. The collection in this example holds business objects of type Employee. You should pass it to the ItemsSource property of RadGridView. After that, you can create your RadDataFilter and bind its RadDataFilter.Source property to the RadGridView.Items collection using ElementName Binding. You can't use both RadDataFilter and RadGridView's built in filtering because they are automatically synchronized with each other. The filtered collection inside the RadDataFilter can be accessed via the FilteredSource property. It exposes this set of data matching to the current filter criteria. 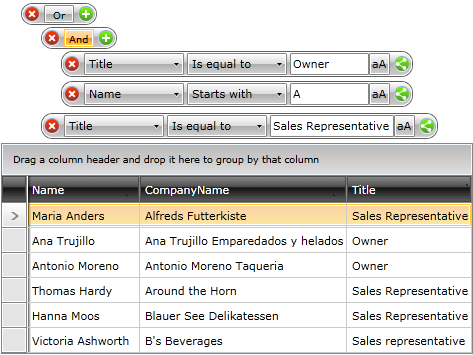 Here is an example of a ListBox that displays the data filtered by the RadDataFilter.